And in order to shed some light on this strategy, I took a look at the current state of 3 smaller-priced estates’ 2005 vintage ( “…of the century”). In fact, as within the current 2010 campaign, there were also in 2005 many Châteaux selling their wines at a great discount compared to the big names and I bought a few of these hoping to get some of the 2005 bling for little bucks. Now, 6 years later, I am curious on how this strategy worked out and what I actually got for my bucks. The outcome might give an indication of what to expect from equally offered bargains of 2010 and who knows, maybe some more interesting conclusions can be made? 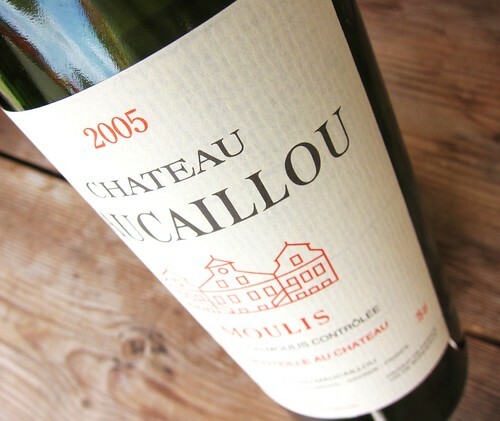 2005 Château Maucaillou, Moulis en Médoc – Primeur price: 16,30 € , Current market price (Germany): 24 € , Primeurs 2010 price: 18,40 €. Château Maucaillou is one of the smaller estates in Moulis (part of Médoc), not in terms of size with its more than 60 hectares, but rather in terms of reputation and price when compared to this appelations’ stars which are Chasse-Spleen and Poujeaux. The ratings back then were 90pts Winespecator, 16/20 Jancis Robinson, 15/20 RVF, 84/100 by JM Quarin. Dark Ruby red color, with the slightest hint of brown on the side where it gets more transparent. Small tears on the glass. Nose of red and black fruit as well as some freshness. On the palate, of medium weight and with a nice silky texture. Fruit imbibes the entire palate. Some notes of graphite, a little liquorice, a hint of freshness. Very fine grained tannins are lending grip and good chewiness but also drying out a bit in the end which holds for an austere edge. Medium to long finish. After a day fruit seems to enter “tertiary territory” while the tannic structure seems to have some more potential. Sometimes a slight floral touch of withered flowers peaks through. Conclusion and outlook: A charming wine with classic Bordeaux personality but not much depth and complexity. Start drinking now with no decant or only a short decant- should drink well over the next few years when following these rules. Definitely not a wine for the long haul! As for the Primeurs 2010, not a wine I would consider buying. The wine lacks a bit of excitement. 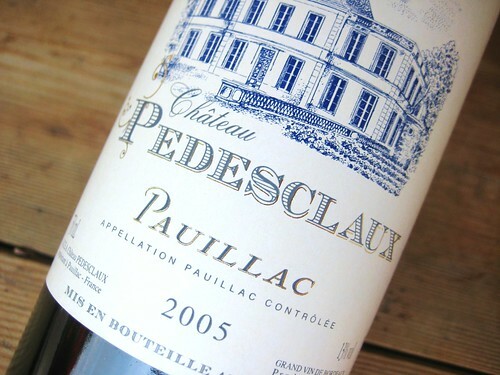 2005 Château Pedesclaux, 5eGCC of Pauillac – Primeur price: 18,60 € , Current market price (Germany): 32 € , Primeurs 2010 price: 29,4 €. Château Pédesclaux is a 5th Grand Cru Classé but far from being one of the “flying fifth” (comprising shooting star Pontet-Canet). The estate is undergoing a positive evolution since a few years, also due to a change of ownership. A growing number of encouraging ratings is confirming this trend. The ratings back then were 16,5/20 Jancis Robinson, 15/20 RVF, 88/100 by JM Quarin. Dark color with a blood like slighlty brick-red rim. Lovely nose of sweet blackberry fruit and leather, also something deliciously floral and fresh. On the palate a soft and velvety texture and medium weight and at the same time showing typical Pauillac personality with dark fruit, leather and that nearly austere touch. But then again it appears fleshy and meaty and with a good juicy acidity backing some blackberry and cassis fruit. Fine grained tannins are showing at the back; the wine is showing good balance, probably best balance of the 3. Finish is very good showing good presence and length, with more air the wine lingers with an intense fresh eucalyptus note mixed with graphite and tar. With the last pour (quite some depot at the bottom of the bottle) the wine shows intense eucalyptus, graphite and tar notes on the palate: delicious! Conclusion and outlook: This wine is very drinkable in terms of weight and balance and at the same time shows a genuine and delicious Pauillac inclination. Of the 3 wines it is undoubtedly the one with most complexity, depth and let’s say it: “Terroir”. Considering the 18 € Primeur price of 2005, this is a stunning value and I would agree with a rating of around 90 points! Start drinking now, it seems more than ready and is maybe even approaching its peak. And this “readiness” is a very important point. I am actually a bit surprised about this current state of the wine. When I last had it 2 years ago it was loaded with tannin and I thought it would need a lot more time. But this probably explains one big difference between such a claret and some of the bigger names trading at higher prices. Their ageing potential is different, even in such great vintages. This isn’t necessarily a downside but definitely something one has to know: you won’t get a Lamborghini when paying for a Peugeot! Best counter-example might be a 2005 Château Pontet Canet 5eGCC I recently tried which was still boisterous and far away from its peak. Nevertheless, the 2005 Pedesclaux is a great value and the actual question is whether or not it still is a good value with a 2010 Primeur price of around 30 €. A difficult question. The raise in price is substantial (+200% compared to 05), the wine being now more expensive than some very reliable Cru Bourgeois such as Chasse Spleen from Moulis (26 € en primeur) which – I know from the 2000 vintage “of the century”- has a good, nicely stretched ageing curve . In fact it is now rather ambitiously competing with some established GCC from Pauillac that are only priced at a small premium such as Grand-Puy-Ducasse (40€). On the other hand, in the 5 years since 2005, a lot of amelioration work might have been done in the estate which could start to pay out, and the further ageing of the vines is a non-neglectable fact, their roots now digging deeper into the aromatic grounds of Pauillac, adding complexity to the Cru. Definitely, a tempting but with that price also a very tricky pick! 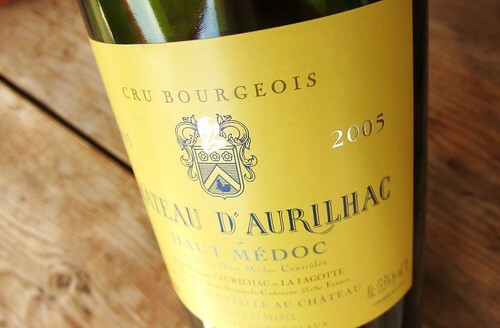 2005 Château d’Aurilhac, Cru Bourgeois, Haut Médoc – Primeur price: 10,50 € , Current market price (Germany): 21 € , Primeurs 2010 price: 11,30 € . 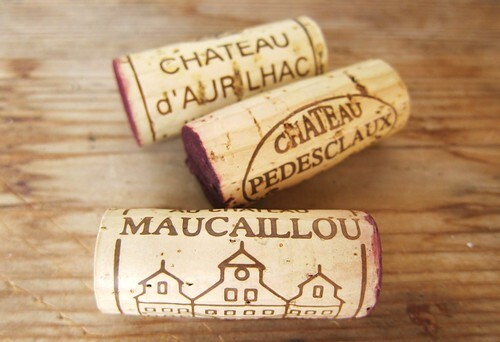 The third wine, Château d’Aurilhac, is probably the one with the lesser pedigree of the 3, even though it received constantly encouraging ratings and praise in the last years. For the 2005 Primeurs, the ratings were 16/20 RVF and 86/100 by JM Quarin. Conclusion and outlook: a charming and straightforward wine with good fruit concentration, revealing the ripe characteristics of the vintage. It appears very expressive but shows less complexity than the Pedesclaux. Start drinking now, even if it still has a short way to go before reaching its peak. Now, concerning its role as a 2010 Primeur wine, the advantage certainly is that the estate has barely changed its pricing (11,30€ compared to 10.5€ in 2005), leaving its sheer quality as the unique deciding factor. The tenor here is, that it represents a charming and straightforward wine, that is definitely marked by the characteristics of the vintage, but without higher complexity and lacking a sense of unmistakable Terroir. If one likes extreme words: this is certainy replacable with modern a Spanish cuvée, its Bordeaux inclination being very reduced. So if one is subscribing this wine, it is in a lesser sense a Bordeaux subscription for Bordeaux’s sake, but rather for obtaining a joyful and straightforward wine with only a slight classic bordeaux touch. But with such a stellar vintage and considering the renewed positive ratings the wine received, one can definitely expect a delicious wine, which furthermore might represent an interesting pick in magnum bottles maybe for one fun birthday bash in 2020. So, a few conclusions have already been drawn for these 3 wines. More generally, I would say that the adage “buy small wines in big vintages” has definitely some truth attached to it. Especially if one’s wallet isn’t too thick. 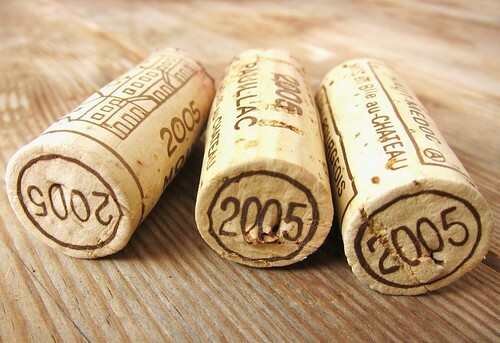 For little money one will obtain charming wines marked by a ripe vintage. What one doesn’t get is a blockbuster that your children’s children will be able to drink. And one can already see from this small comparison, that the wine that carries the biggest sense of Terroir here is also the one that shows the most ambitious pricing development, namely Pedesclaux. The pricing of the latter brings up the question whether it is worth subscribing it? Or does it make more sense to look directly into the medium priced wines of established Châteaux? Thorough reading of the various ratings is a requirement. Another interesting observation, but more for myself: this comparison made me realize that JM Quarin is the critic here that is most in line with my own appreciations. Something that might help me in the future. Finally, there is also one aspect which might come into play. 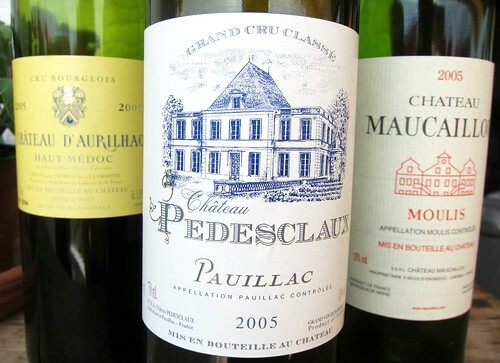 The idea that modern Bordeaux are ageing much faster. But that is another story, even if these bottles also were fuel for thought in this direction. Wishing happy subscriptions and bargain-hunting to everyone. I have tasted the 2005 Château Pedesclaux recently in April and I like it a lot. The nose, the palate and the acidity is exactly my type of wine. I do agree the finish is not as long as other big names in the market.But still I think it is the bang for the bug. Planning on buying several cases for self consumsion. Can you please advise me on the life span of the 2005 Château Pedesclaux. When is it ready to drink and how long does it need to be aged until reaching the peak and in what years it is going to fade. Thank you so much. Hello Matthew, thanks for your comment. If you want to buy several cases for self-consumption, I’d definitely consider buying magnum bottles as well, as they have a longer time to maturity. The bottle I’ve tasted last year was delicious, but as I’ve written above, not too far from its peak. Cheers!